The TVB Star Awards Malaysia 2013 ceremony was held in Kuala Lumpar on Sunday, December 1, 2013. 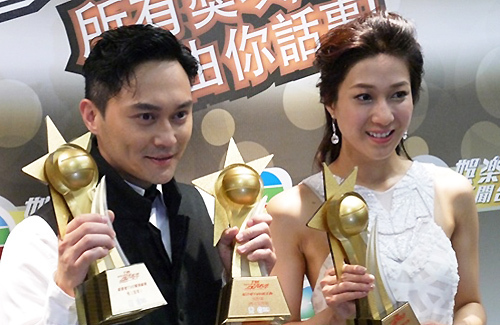 Chilam Cheung (張智霖) and Linda Chung (鍾嘉欣) won the My Favorite TVB Actor and Actress awards. The cast from Triumph in the Skies 2 <衝上雲霄II> nearly swept all awards categories, including TVB Favorite Drama and many Favorite Character awards. Chilam’s popularity soared after the broadcast of Triumph in the Skies 2 , where fans were mesmerized by his role as Captain Cool, allowing him to sweep awards throughout Asia and boost his income significantly. Chilam joked, “It turns out that many people like me in flirtatious roles!” Chilam thanked the cast of Triumph in the Skies 2, including his “Little Sister” Myolie Wu (胡杏兒), Kenneth Ma (馬國明), and Ron Ng (吳卓羲) as well as fans for their support. 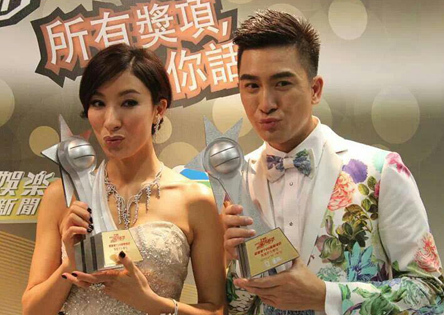 Him Law (羅仲謙) and Nancy Wu (胡定欣) won Best Supporting Actor and Actress awards for their roles in Triumph in the Skies 2. Benjamin Yuen (袁偉豪) and Eliza Sam (岑麗香) won the Most Promising Actor and Actress awards. Both stars have been highly promoted this year and assume high-profile roles in The Hippocratic Crush 2 <On Call 36小時II>. Benjamin and Eliza were moved by their first major award wins and thanked the audience many times. Continuing their popularity from last year, Tavia Yeung (楊怡) and Kenneth Ma (馬國明) won the Favorite Onscreen Couple Award for The Hippocratic Crush 2. The winners of the Favorite TVB Character awards came as little surprise, since the stars were spotted at the airport boarding their flights to Malaysia the day before. The fifteen winners include: Kenneth Ma (The Hippocratic Crush 2); Tavia Yeung (The Hippocratic Crush 2); Mandy Wong (The Hippocratic Crush 2); Ruco Chan (Brother’s Keeper); Edwin Siu (Brother’s Keeper); Linda Chung (Brother’s Keeper); Kristal Tin (Brother’s Keeper); Bosco Wong (A Change of Heart); Wong Cho Lam (Inbound Trouble); Francis Ng (Triumph in the Skies 2); Ron Ng (Triumph in the Skies 2); Nancy Wu (Triumph in the Skies 2); Chilam Cheung (Triumph in the Skies 2); Fala Chen (Triumph in the Skies 2); and Myolie Wu (Triumph in the Skies 2). Formerly known as the My Astro On Demand Awards, the ceremony was produced by TVB this year and broadcast live to respective overseas channels. In past years, the results of this awards ceremony served as a good predictor of the TVB Anniversary Awards. Raymond Lam and Kate Tsui, who were both hot contenders for the TV King and TV Queen awards last year, did not win any awards. Since the broadcast of Highs and Lows <雷霆掃毒>, the two have not generated much buzz. Raymond spent all of 2013 filming mainland Chinese dramas and movies, and did not appear on the TVB screen and did not any nominations this year. On the other hand, Kate’s performance in Sniper Standoff <神鎗狙擊> was criticized by viewers. Although she made it onto the nominations list, her character was not well-received and did not garner a large volume of votes. Just wanted to know if Francis Ng was also present during the award presentation. i guess Francis Ng don’t care those award! Francis Ng is a class of his own. Francis should be laughing as Chilam won, haha… 3 cheers for Mr. Cool and 5 stars for Mr. Ng’s performances. 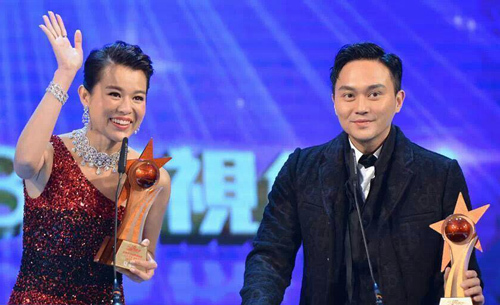 Congrats to Chilam & Linda for win TVB Stars Award. do anyone knows where i can watch this show? chilam not deserved to win it. the winner supposingly should be mine! I think Raymond Lam didn’t really bother to get an award from TVB/ASTRO because he can get so much more awards outside TVB. Recently he got 3 awards from Music Pioneer and 3 awards from Yahoo Asia Buzz,which is bigger than those TVB awards. Why I said so,because it is involved many countries and didn’t only considered artists from Hong Kong. WELL DONE AND CONGRATULATION TO LF!!! He has quite a lot with Astro already (Won Astro BA twice). So of course he dun aim for Astro award anymore. The Yahoo one is in fact only for HK area :). WTH Linda won TV Queen?!?!? Wished it was someone esle but meh. Chilam is old, he shouldnt win, he looks CHOK but cant really act! Ruco is better than him CHOK + good acting. I’m rooting for Ruco too. It’s been a long time since anyone has touched me so much with his acting that i’m actually taking an interest in all these awards shows. Yep honestly age doesn’t mean you can act better. Ruco is younger than Chilam and Francis but both elders tend to chok while Ruco acts from his heart and soul. Ruco is a much better actor but very underrated but very underrated by TVB and media! Am I the only one who think that sel_fi_wu met a lot of her successors/twins here? The name is only changed from Myolie/Ma Ming to Ruco. Nothing wrong with voicing our support, at least it’s coming from different people. If it’s Raymond Lam’s turn, I’m sure you’ll be voicing your support tirelessly for him too. I have no problem with voicing supports (or support to do so), but not the ones like “A is god, everything else is trash”. If wanna praise, please praise reasonably. If wanna criticize, please criticize politely. Don’t act like sel_fi_wu (who I find some are so similar to her such as Mydatewithspring or Pete). @Fox “If wanna criticize, please criticize politely”, lol, is there even such a thing? Your comments will be closely scrutinised henceforth. Just move on and accept the fact: Chilam already wont the BA. He deserved to get this kind of recognition. No need to put Chilam down if your idol Ruco couldn’t win this year. His time will come eventually I suppose. Ruco definitely deserves to have some recognition. He has been filming overnights before he rushed to the AOD award. Fans saw him in the airport said that he had reddened and running eyes and was not in condition for the event. But he supported BK and the team. Love his spirit. Now Ruco is leading or top two in both public poll. Good job to us all and keep voting. If you are HK citizen please vote Ruco for BA and MFC. I heard that Ruco is leading in both category from HK fans.